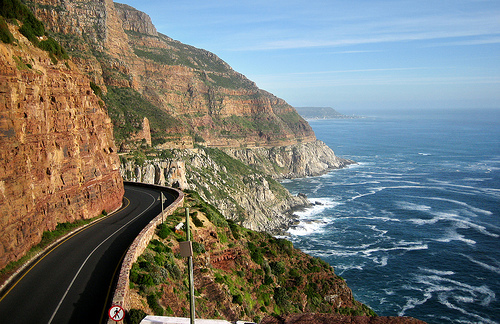 Chapman’s Peak Drive, or Chappie’s as it is affectionately known to the locals, is known the world over for its beautiful, scenic route along the mountains next to Hout Bay. It is regularly regarded as one of the most spectacular and breathtaking coastal drives in the world and features on our list of Top 5 Tourist Attractions in Cape Town. You do not have to worry about looking and driving as there are numerous stop-off points for you to climb out and take snaps of the scenery with your camera. Take in the scenes as the Atlantic stretches out to one side and cliffs rise steeply on the other. The way to Hout Bay is one of green forests and lush vineyards that climb eagerly up the valley walls. Mountains fold away as you burst through the winding roads alongside which sit sleepy cottages, grazing horses and beautiful villas. Restaurants neighbour the banks of the dunes where people enjoy taking their dogs for walks and flying many fanciful kites and gliders. The harbour itself is always teeming with life with fishing boats and yachts creating a steady bustle around the harbour. If you end up making the trip during a fine Sunday morning, you may also be tempted to investigate the famed Hout Bay Market which has all manner of things to buy and foods to taste. The suburbs along the Atlantic Seaboard are affluent and desirable: the crisp, white sand of its beaches contrast starkly with the enchanting blues of the ocean. With the celebrity lifestyle and warm climate, there is very much an air of Mediterranean glamour. Drive along the palm-lined Victoria Road, the main thoroughfare through Camps Bay, until reaching the smaller, quieter suburbs of Bakhoven and sleepy Llandudno. Rest assured, you will want to stop on the way to take a dip in one of the many blue flag beaches, so make sure to take a towel and some snacks. Simonstown has a rich naval past and was once the home of the famous Just Nuisance, the Great Dane who has become synonymous with this part of Cape Town. As you leave Lakeside along the mountain road of Boyes Drive, Muizenberg will stretch out before you. Cruise along until you reach Kalk Bay, diving down the slopes to be greeted by a myriad of curio shops, charming pubs and antique dealers as locals and tourists crowd the narrow main road, all mingling together in this melting pot of culture and history.